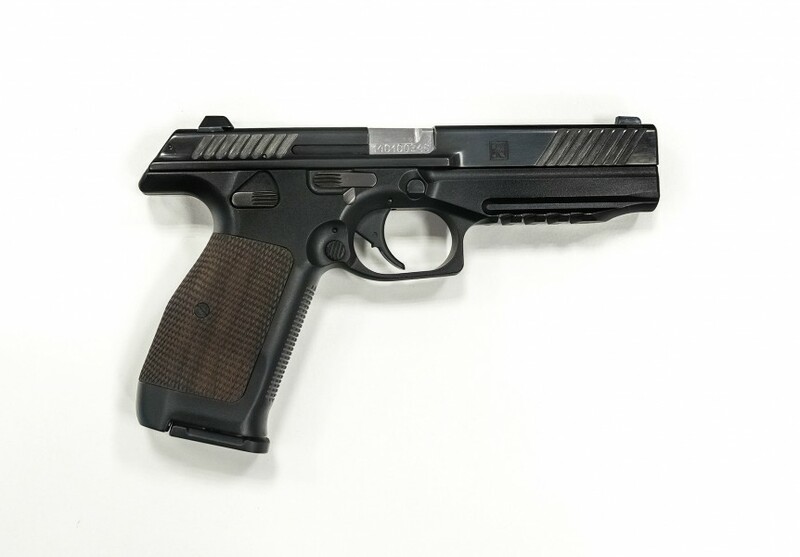 Kalashnikov Concern of the Kalashnikov Group revealed their new PL-14 (Pistol designed by Lebedev) at the International military-technical Forum this month in Kubinka (Moscow region). Interestingly, the concept was developed jointly by Russian special forces and IPSC competitive shooters and the company has made a point in making that clear. “The versatility of our new pistol allows to use it not only as a military weapon for the military forces and police, but also as a pistol for different shooting competitions – said Kalashnikov CEO Alexey Krivoruchko. – We intend to produce different variants of the pistol, for example, with certain characteristics of the trigger mechanism for special forces units, as well as a civilian version with trigger that would be suitable for practical shooting competitions as well”. With all the stuff on the right side it will make it difficult to place the index finger along the side of the gun until ready to shoot. Will also prevent placement of the index finger along the side of the gun for aiming, and pulling the trigger with the middle finger, which was a known method of pistol shooting at the time of the adoption of the 1911, and is an effective way of shooting at CQ. To bad for the Russians, but good for their opponents. Also, there must be lots of left handed Russians. Good for competition I guess, but then how many Russian soldiers will have the money and time to become competitive shooters. Looks like another brilliant government (theirs), move. Chalk one up for the competition folks and sight shooting advocates, even though there is no proof in the form of pics and videos of Sight Shooting ever being used effectively in a CQ defensive shooting situation. Would be nice if someone figured out what shooting method is effective and used by those with minimal training (your run of the mill soldier or police officer), and then designed a pistol to enhance its use. >> Good for competition I guess, but then how many Russian soldiers will have the money and time to become competitive shooters. There is enough activity that Russia is an official IPSC region and the Russian military sought to confer with those competitors. Russia also has solid conventional participation via ISSF events and has contenders at the Olympic level. >> Chalk one up for the competition folks and sight shooting advocates, even though there is no proof in the form of pics and videos of Sight Shooting ever being used effectively in a CQ defensive shooting situation. Wrong. I have video and photographic proof on this site and you commented on it. The fact that you ignored the reality is your problem. >> Would be nice if someone figured out what shooting method is effective and used by those with minimal training (your run of the mill soldier or police officer), and then designed a pistol to enhance its use. This is like decrying a barbell as useless because it requires the user to actually do work in order to enhance its use. That is the real problem. If progress is to be made organized, on-going work must be performed. There is no effective solution if “minimal training” is the primary goal. This takes less total time per week than basic dental hygiene and it can be done by anyone with access to firearms if they have the will to do it. Ruby used it when shooting and killing Oswald at close distance while both were moving. Trying to use the sights to hit the smallish and moving target in the time available would just not work. Check out the video/s that are easy to find on the web and see for yourself if he would have had the time to focus on the sights and pull/squeeze the trigger to accomplish his mission. Further, this is from John Minnery’s 1973 book: Kill Without Joy, which is not a read for the weak of heart or squeamish. Using value laden words as “unestablished” and “unproven” to knock a method that works is questionable to my way of thinking. As It would be a simple matter for anyone to prove that the method works with a minimum of effort and the use of common sense in handling firearms. It can be learned and used and maintained with no or minimal training. Dry firing is a cinch. Point your finger at anything and say bang. :) This not to make light of a deadly effective shooting method, but it is what it is. Shooting is not rocket science. That same cautionary language, or language close to it, is repeated in other military manuals published in later years. Those that I have found are dated: 1912, 1915, 1917, 1918, 1920, 1921, 1922, 1925, 1926, 1927, 1929, and 1941. And I am sure that there are many more manuals. which I am unaware of. “It is clear to me that in the pic with the flames coming out from the gun that the shooter is squared to the target, and that the gun is in a two handed grip that looks much like an isso grip, and that the gun and sights are positioned above the bottom of the shooters vest, but also well below the line of sight of a shooter of the size shown in the picture, and who is seen in other frames of the video clip. Your edit/view/zoom feature can increase the size of the pic if needed. As to my bias, for years and years, I have been looking forward to and am open to receiving a video or pics of sight shooting being used effectively in a CQ life threat situation, and have a page on my web site decicated to the posting of such. It’s been empty for years and years. A “technique” used to ambush an unarmed, unaware, detained, shackled and already-captured man at arm’s length? That’s some next-level stuff! Here are photos and video of this shooting. I’ll let the reader decide how much skill/technique was required. >> Using value laden words as “unestablished” and “unproven” to knock a method that works is questionable to my way of thinking. Then put some numbers and measurements to define what you consider to be “established” and “proven” methods. You have videos of yourself plinking at a pie tin with an airsoft pistol in your garage and on a single, large paper target at close range. The shooting is slow and not particularly precise, there is no time or accuracy standard given. I suppose that is the best we can expect from someone unwilling to train or work on skill beyond a quick, single, introductory session. This is like teaching barbell training with a length of PVC or wooden dowel, never adding weight, then defending the approach against detractors “using value laden words” when they ask for measurements of progress beyond the novice introduction. In one second in the video (second 8 to 9), Ruby moves out and shoots Oswald who is also moving. 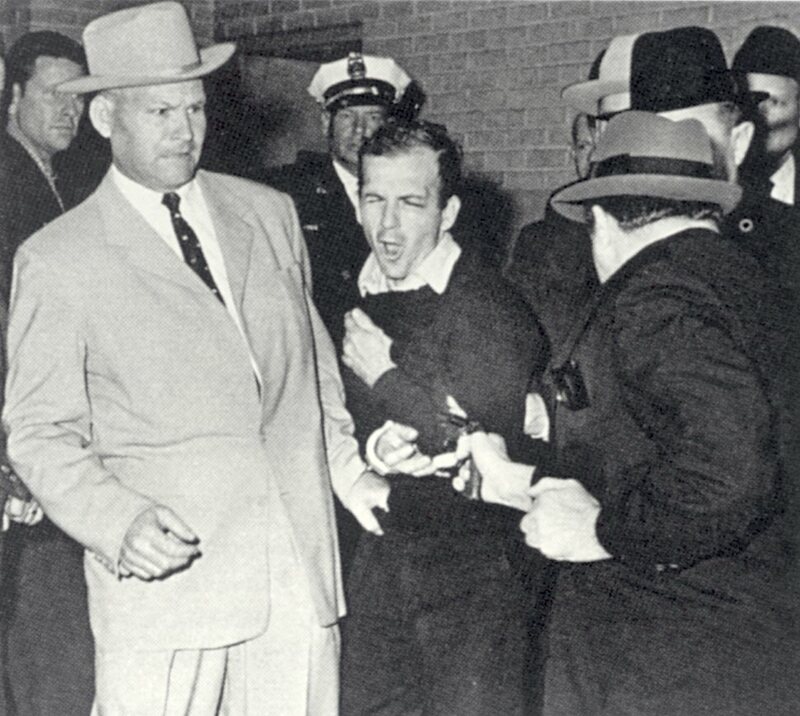 Ruby shot him in the stomach area and surely did not have time to bring his gun up to get a flash sight picture and shoot down at Oswald. The dynamics of the situation, dictated what could work, and it wasn’t Sight Shooting. As to my plinking, here’s a link to a short clip of me shooting at and hitting 7 aerials (pop cans tossed into the air) in a row. The dynamics of the situation made the use of Sight Shooting moot. The time for both aiming and shooting was .2 to .3 of a second. Using the index finger to aim a firearm is mentioned in books dated: 1804, 1810, 1816, 1829, 1835, 1870, 1885, 1898, 1900, and 1903. And the standard cautionary language against its use with the 1911 appears in 12 different military manuals published in 1912, 1915, 1917, 1918, 1920, 1921, 1922, 1925, 1926, 1927, 1929, and 1941. Kemp – Pat # 694969 Mar. 1902 – A clip is attached to the side of a revolver just in back of the cylinder which extends forward in parallel with the cylinder. The index finger is placed against the clip for aiming. Gardner – Pat # 896099 Aug. 1908 – A finger rest is attached to the side of a shotgun just above the trigger guard and in parallel with the barrel. The index finger is placed on the rest and against the side of the shotgun for aiming. “This invention relates to a device adapted for attachment to fire-arms of various kinds, more especially to shot-guns or hunting rifles, and has for its object to facilitate quick and accurate pointing of the weapon without being obliged to adjust the gun-stock to the shoulder for aiming at birds just rising from the bush or in flight, or at other game. Furst – Pat # 2109993 Mar. 1938 – A somewhat odd device that is slid over the barrel and used in conjunction with the index finger for natural aiming via pointing of the index finger. Stahle – Pat # 5166459 Nov. 1992 – This invention features a guide plate that is attached to the side of a revolver. The plate has a groove in it that is parallel with the barrel. The index finger is placed in the groove for aiming. It is clear to me that the continually repeated cautionary language found in different military manuals on the 1911, which were published in a 29 year span (1912 thru 1941), obviously squelched the use of the index finger for pistol aiming, and continued the 40 additional years of the 1911 being the standard issue sidearm of US forces. And it follows that based on 70+ years of suppression, it is no wonder that it was not widely known of, or accepted by the shooting public at large. What other outcome could one expected, and particularly so, as the core of civilian and police trainers over the years, would be made up of former soldiers and their trainers, who were steeped in the dogma and practices of the military. The downside of the suppression to accommodate a flaw in the slide stop design, was that for 70+ years our military men and women were denied the option of using the very simple, natural, and accurate method of shooting close range objects via aiming each shot with the use of the index finger. They would instead, have to rely on the use of the sights, or another method of shooting in kill or be killed situations, in which the environmental conditions, or the dynamics, or the time constraints, would make the use of the sights moot. It is unknown how many of our men and women at arms were shot and/or killed in the 70+ year reign of the 1911, due to not having the option of using the index finger method for aiming (P&S). The design flaw of the 1911’s slide stop could have been fixed easily, but it was not. The Soviets made a simple fix to their Tokarev pistol whose slide stop was like Browning’s 1911 design. 1.5 million were produced. Guns should and can be designed for optimal CQ combat use and effectiveness, given what is known about the shooting method/s used in them. Pistol designs, which are not based on scientific studies of CQB situations in which there is the greatest chance of a user being shot and/or killed, will only perpetuate the existing status quo and do nothing to assist in reducing police casualty rates that have stayed just about the same for the past twenty years. Holding users accountable for not doing or getting extra training that many say is needed to become a competent or competitive level sight shooter or handgun user, doesn’t help. to ambush an unarmed, detained, handcuffed person at contact distance. 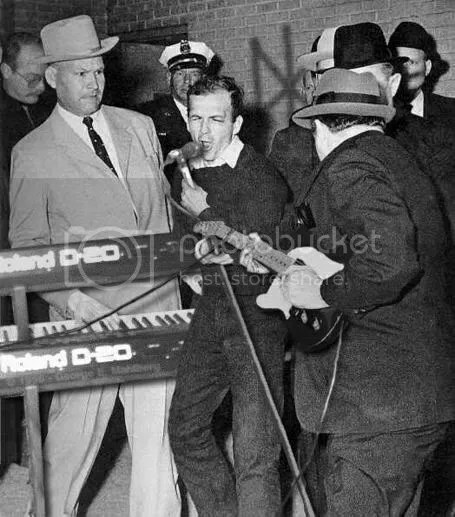 Ruby nearly knocked Oswald over, he was so close the unaware man he ambushed and shot. Yes, quite a dynamic critical incident. Shall we cite old books mentioning the Earth is flat? Prominent scientists once proposed the universe was composed of a transmission medium called aether (or ether) but since Einstein’s theories of relativity became established formerly-popular theories using a substantial aether are not used anymore in modern physics. You can still find old books and papers that said it but we’ve learned better since. The difference is scientists form an actual hypothesis that can be tested and measured. Einstein’s theories weren’t accepted merely because he said so. They proved better by actual test and measurement, many sorts of tests over many years. Competition shooting is a way to test theories and ideas about shooting. Point shooting, like aether, used to be accepted as ideal. Similarly, debunking a popular theory was not taken lightly but people involved that actually bothered to compare and test it could no longer deny the weight of compiled evidence over many years. Put some numbers to your assertions. Measure what you believe is “better” and prove it is better than other approaches. Earning a respectable classification from a recognized national-level shooting organization while using your approach is a good start. Slow plinking on large, close targets in your garage is not. um… you were saying? This video came out within days of your comment.